The key concepts to be integrated across Personal and Social Identity such as: POWER, SOCIALISATION, IDENTITY, SELF, RIGHTS, FAMILY, ETHNICITY, KINSHIP and so forth fit in well with this study. Teachers may also wish to introduce other concepts such as inequality, discrimination, socialisation, alienation, acculturation and social differentiation. Students could be asked to share their responses to the classroom activities verbally with others in a small group which then reports back to the whole group. Students could consider the effectiveness of the ‘interview’ technique of social research. View the video clip and then complete the following tasks. Consider the visits to Vanuatu by Joe and Monica Leo. Why is the initial journey to Vanuatu important to them? What can we learn about notions of ‘identity’, ‘kinship’, ‘self’ , heritage’ and ‘family’ from watching the clip and reflecting on the experience of the Leos and other Australian South Sea Islanders who have felt compelled to trace their kin, reconnect to the land of their ancestors and learn more about their cultural heritage? What other Society and Culture concepts come to mind as you reflect on this clip and the story of Australian South Sea Islanders? Identify the various social and cultural groups to which Joe and Monica Leo belong. Can you identify one that seems to be the most important to each of them? Research the Joskeleigh South Sea Islander Museum in Rockhampton. 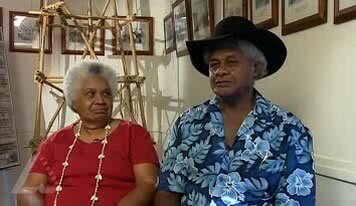 What function does the Joskeleigh South Sea Islander Museum in Rockhampton play in the life of the Leos and other Australian South Sea Islanders?